We started the last day of January cruising towards a beautiful rainbow. 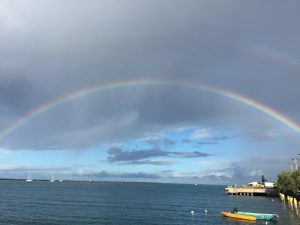 Of course rainbows are often accompanied by rain, and though we managed to avoid it at sea, even if we hadn’t, we figured a little rain wouldn’t affect the whales…they’re always wet anyway! Guests on our Mid-Morning Whale Watch Cruise spent considerable time with Mom Humpback and her baby. Both of them were on the surface a lot (of course we saw more of baby than we did of Mom). And since baby whales, like baby anythings, are pretty uncoordinated, it was a lot of fun watching him squirm around on the surface. Right after we dropped off the folks from that cruise, we re-boarded the students, parents and teachers from Hawaii Preparatory Academy’s 3rd grade class for a dedicated Educational Whale Watch Cruise. The winds had picked up by then, but the keiki brought us luck — we were barely out of the harbor before we found our first spout. This was from a solo whale who was on 18 minute dives, so we stuck around and watched him through 3 cycles (he actually surfaced pretty close to us). After that, we watched a different solo Humpback who was cruising towards us — this whale was on 4-5 minutes dive cycles, so we got a few views of him on the surface before we had to head back to the harbor. Have a great weekend. I’ll send out our next report on Monday. Ocean Sports Whale Fact of the Day: The maternal instinct of the Humpback is so strong that she demonstrates allomaternal behavior. In other words, she’ll even take care of other small animals in danger! In 2009, 2 scientists sailing off the coast of South America watched as a pod of Orcas flipped a Weddell Seal off an ice flow. The seal began swimming towards a nearby Humpback. Just as the seal got close, the whale rolled onto her back, sweeping the 400 pound seal onto her chest. As the Orcas closed in, the Humpback arched her back, which lifted the seal out of the water…unfortunately for the seal, the water rushing off the whale started to wash the seal back into the sea. The scientists were astounded to see the Humpback use her flipper to gently nudge the floundering seal back onto her chest. Moments later, the seal slid back into the water and swam to the safety of a nearby ice flow.